Hey there. I'm music guy. I love music. I read music, I play music, I analyze music, I listen to music, I live and breathe music. So it's no surprise that I surround myself with music whenever I can. Though I prefer to completely submerge myself in music with a set of headphones, sometimes you simply cannot tune the whole world out and will need to find an alternative. Enter the 80Boy Rechargeable Speaker! Our good friends at 80Boy provided this awesome speaker to try out and review and you know what... I absolutely love this thing! It's compact, it's loud, it's easy to use, and it's extremely practical! Let's get right to it, but first... let's talk specs! Full Charge from Dead to 100% in Approx. 1 Hr. Anyways, I pulled out the speaker and find that it's a relatively small white and green speaker. About 2 inches all around. The 3.5mm jack sticks out from one side and on the opposite side is a sliding button to turn the speaker on and off. The other two sides of the speaker consists of the sound holes where music and what not will come out of and the opposite end has this spongy/elastic wall thing with the words, "Hello Music" written on it. I poked it with my finger and then realized very quickly that I probably should do that. It seems pretty strong and I have no idea what it's for but I'm certain that if you press hard enough, you'll probably punch through it. My best guess is that it's there to... vibrate? Offer deeper base? Look cool? I guess we'll find out once I give it a test run. As for cable, the cable is a USB to 3.5mm jack which is not necessarily a standard cable. The downside to this is that everything now a days charges up with a lightning cable or a MicroUSB cable. If you were to lose this cable, you may not have another cable readily available for charging. The 80Boy Plug In Speaker is set to be just that, a plug in speaker. That's good and bad. The good thing is that if you don't have bluetooth capabilities, this speaker is perfect. It's bad, because bluetooth is awesome and you can set your bluetooth speaker anywhere you want music. 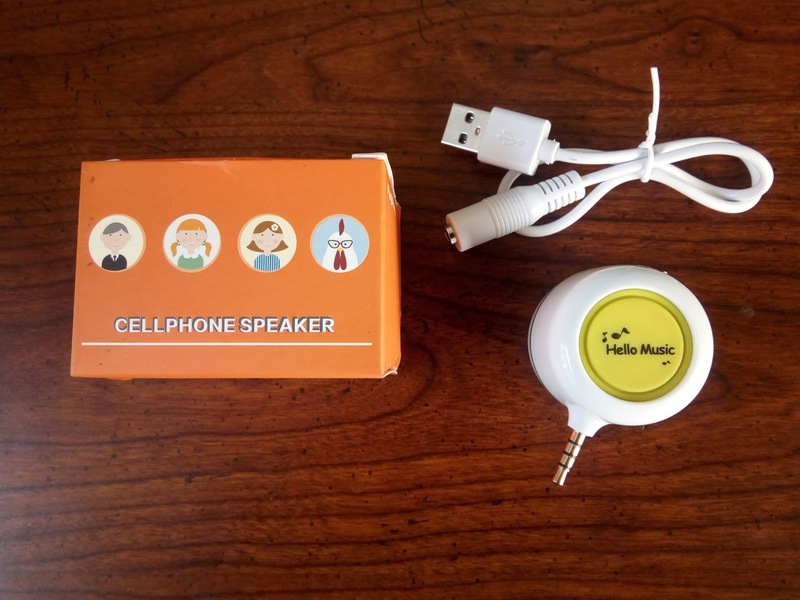 With this speaker, you must plug it into your device and carry it with you. Not necessarily a bad thing, but can be a bit annoying if the speaker is plugged into a phone and you are moving around with it. The speaker sticks out a bit and can be a bit of an eyesore. That doesn't mean that it's ugly, just that I personally don't like things sticking out of my phone. I guess I'm just so used to being wireless that it's a bit weird to me to have a speaker sticking out of my phone. But this is a speaker and that's what it's supposed to do... so let's turn on the music and see how well it performs. The sound quality of the 80Boy Plug In Speaker is absolutely amazing! I was genuinely surprised by how good the sound came out of this tiny speaker. Music was super crisp and clear. I ran the speaker through my usual gamut of music genres (hard rock, R&B, classical, metal, rap, etc. etc.) to test it out. And to be quite honest, it performed well while playing all genres. The bass sounds were booming (may have something to do with that elastic/spongy thing I mentioned early but can't say for sure), the mids were clear, and the highs were super crisp. And you won't believe just how loud this bad boy can be! I was astounded by how well the sound fills the room when you have it turned up all the way. And the best part about it is that the sound quality does not suffer! No muffled sounds, no muddy music. The same, crisp sound you get at a lower volume just louder! Big points for you guys there, 80Boy! I also decided to give the speaker a go while watching YouTube, because you know... just because. lol I fired up one of my current favorite channels (shout out to to Professional Sh*tbag, Geoff Thew at Mother's Basement) and tuned in to one of it's recent videos. Needless to say, the speaking voices came in just as good as singing voices. Great job, 80Boy! The charge time on this 80Boy Plug In Speaker is simply phenomenal! It charges up from dead to 100% in about an hour! And the best part is that you get a good 5 hours or playing time out of that single charge. That's pretty cool, if you ask me. Those 5 hours are more than enough to get most tasks done so if you need a speaker to play some music while you're up and about doing chores at home or whatever. If you ask me, it performs best when you, "set it and forget it." Just leave your phone somewhere with the speaker and just let it play. I did this many times when working in the garage. This 80Boy 3.5mm Aux Audio Jack Plug In Rechargeable Speaker is pretty amazing. I wasn't expecting exceptional sound quality from a small speaker. Especially one that you have to plug into devices. The only thing that I can honestly say that I wasn't too thrilled with is the color selection. The one and only set of colors that this comes in is white and green. In a world where practically everything is customizable, it would have been great to get a few set of colors to choose from. 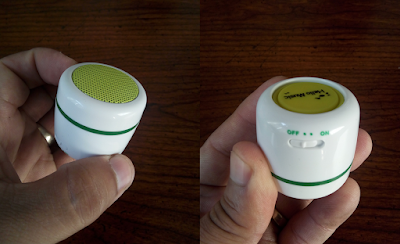 Other than that though, this is a mini speaker that you'll want to get your hands on! 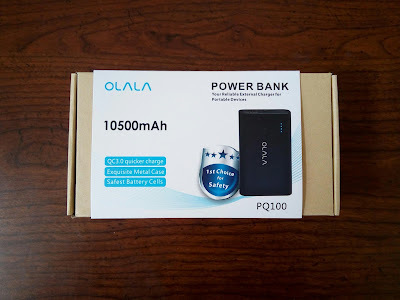 It's small, it's powerful, and it's relatively cheap! You can score one now at Amazon for under $10! So what do you think of this mini speaker? Something that you'd be interested in getting? What are you experiences with plug in speakers? Let's hear it in the comments, friends! I may just put one up to give away! Later!